Click on each title to listen, or right click on it and then chose the "save link as" option for download. "Al mundo le falta un tornillo", (Tango) Aguilar y Cadícamo. "Atenti pebeta", (Tango) Ortiz y Flores. "Boliche el Cuco", (Milonga) Acosta y Supparo. "Canchero", (Tango) De Bassi y Flores. "Como dos extraños", (Tango, 1932) Láurenz y Contursi. "En la vía", (Tango) Vaccaro y Escaris Méndez. "La Canchera" (*), (Milonga) Solabarrieta y Acuña. "Melodía de arrabal" (*), (Tango, 1932) Battistella, Le Pera y Gardel. "Palermo", (Tango) Delfino, Villalba y Braga. "Pituca", (Tango) Cadícamo y Ferreyra. "Suerte loca", (Tango) Aieta y García Jiménez. (*) Recorded live at "Espacio Ecléctico", September 2006. Gustavo Braga: vocals and musical director. All themes arranged by Gustavo Braga. Recording engineer: Gaby “Ciru” Lago. Recorded at Viyurca, July 2006. Masterized in Viyurca, by the General Paz Park, July 2006. 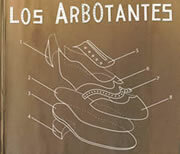 "Los Arbotantes" is an inedit album recorded along with Nelson Murua and Ruben Robledo, an afternoon on July 2005. All takes are direct shots, without any editing, guitars and vocals recorded at the same time, much in the old day's fashion. There have been no written arrangements, and several pieces were played together for the first time that very session. "Arbotante" (spanish for "Flying buttress", or "arc-boutant") is an architectural term naming the arc used in gothic cathedrals to sustain the structure from the outside. The effect given from the inside it is much as if the whole building were hanging thanks to some kind of divine power. That very idea, of an impressive and somehow disguised work, skillful but humble, inspired the present release. "Tango song with guitars accompaniment" became the tango subgenre "flying buttresses" like Murua and Robledo helped to shape out deep into our people's likes, with its distinctive notes of persuasion and pride.